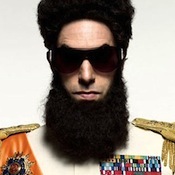 Deadline Hollywood reports that Paramount Pictures have postponed the release of their comedy The Dictator. The Sacha Baron Cohen film was originally set to debut on May 11, head-to-head with the new Dark Shadows movie, but will now reach cinemas on May 16. Deadline say that the comedic elements of the Dark Shadows trailer have prompted the decision: "Paramount didn’t want to risk cannibalizing the comedy audience by bashing heads with a rival on the same opening weekend." With The Dictator seen off, Dark Shadows is now the only major studio release in that week, though is likely to encounter heavyweight competition from superhero flick The Avengers, out on May 4. However, the move does indicate industry insiders' confidence in Dark Shadows as a major release in the summer's movie slate, and bodes well for the film's fortunes as the box office. Ha Ha! The Dictator didn't stand a chance against Dark Shadows. Sorry Sacha, thanks for what you did at the Oscars though! Can't wait May 11th, 2012 DARK SHADOWS embrace us with it's chill bite mystery. You and the legions of fans did it Stuart! Congratulations! Nice to have DS for this century. Hoping the 2004 Pilot will be available to fans one day and the Night of DS restored movie version. PS when will Lara's new DS book be out?